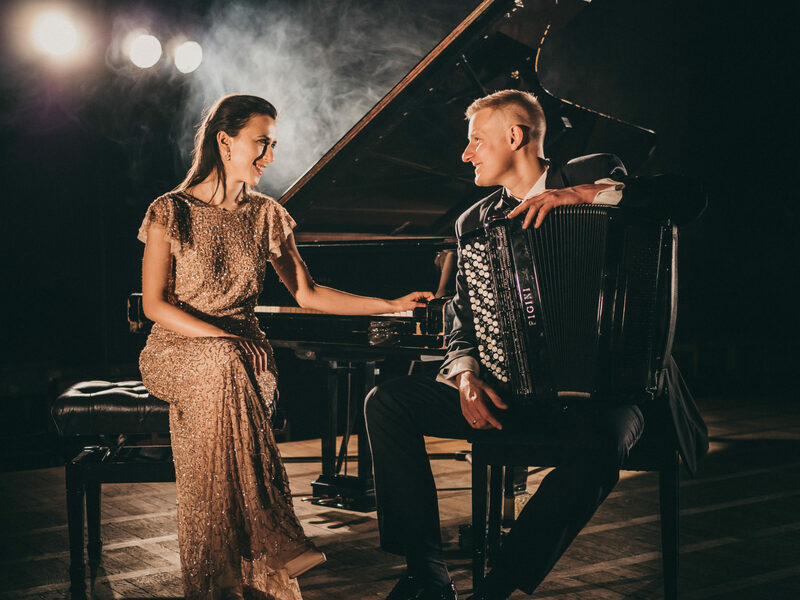 The Wolańska/Gajda Duo is an unusual combination of piano and accordion in chamber music; a combination of the instruments which do not occur in classical consort but provide unlimited performance possibilities. The ensemble was found in 2014 by pianist – Julia Wolańska-Gajda (1988) and accordionist – Michał Gajda (1987). The musicians play concerts in Poland and abroad (USA, Asia, Europe) on a regular basis. They had their debut in the most prestigious concert halls in the world: Carnegie Hall in New York and Berlin Philharmonic. In March 2018, the Wolańska/Gajda Duo had a concert tour around Asia. The musicians had their debut in Kioi Hall in Tokyo (Japan), Guri Art Hall in South Korea and Vietnam, Indonesia, Malesia, Cambodia, and Thailand. 1st prize at International Music Competition in Val Tidone (Italy/2015). In their ensemble’s repertoire, we can find musical pieces originally written for these instruments as well as proprietary transcriptions from baroque music to contemporary tango. Julia and Michal are graduates of I. J. Paderewski Academy of Music in Poznań in the classes of piano by prof. Waldemar Andrzejewski and accordion by prof. Jerzy Kaszuba. The duo had an honour to practise their chamber music skills under a supervision of prof. Teresa Adamowicz-Kaszuba, prof. Laura Sobolewska-Kluwak, prof. Mie Miki (Japan), prof. Stefan Hussong (Germany), prof. Geir Draugsvoll (Denmark), prof. Ivano Battiston (Italy). Their artistic activities consist of solo concerts and solo concerts with orchestra as well as delivering master classes. They are also a jury at international competitions. In 2018, they were awarded the academic degree of PhD in music art, specialisation – instrumentalism.